Congratulations to you and your graduate on reaching a new academic milestone--now it's time to celebrate! 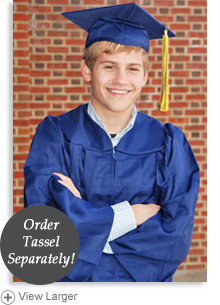 This matte finish cap and gown was made by a leading manufacturer of academic apparel, and will put the finishing touch on your graduate's special day. The origin of academic regalia, particularly the cap and gown, dates back to the 12th and 13th centuries. Over the years, American education councils and committees have continued to modify and standardize guidelines for academic regalia. Need some tips to pick out the right cap and gown? Read on! Choose the gown according to the graduate's height. The gown should fall midway between the knee and the ankle. Click the pull-down size menu to make your selection. Description: Gowns are made in the USA from lightweight, durable polyester with a matte finish. Each gown is traditionally designed with a square yoke. The front is pleated and closes with a zipper. *We've done our best to capture the true color of the gowns in these pictures. But the colors may still appear lighter or darker than they actually are in person (depending on your device's screen settings). Please note that the gowns have a matte finish and are not shiny. Caps should be worn flat on the head, with the corner centered on the forehead. Description: The caps are made from the same lightweight, durable fabric as the gown. Each cap is a traditional four-cornered mortarboard, with a fastener in the center for the tassel. From D John Lindquist of Forest, Virginia on 6/11/2018 . From Darlene Lee of Dallas, Georgia on 5/23/2018 . From Becky Eastling of Bemidji, Minnesota on 3/14/2018 . From Julie Moss of Cranberry Twp, Pennsylvania on 4/25/2017 . From Anonymous of Upper Marlboro, Maryland on 3/15/2017 . 3/4/2015 – Is the cap and gown a shiny finish or matte?